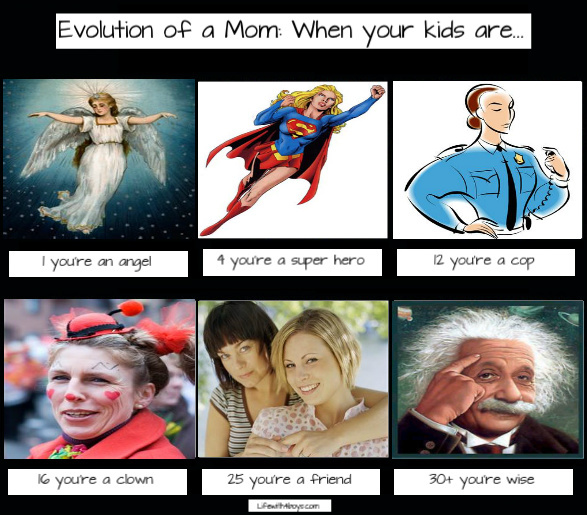 Yesterday I got to thinking about how much our roles as moms change throughout the years depending on what our children need from us or how they view us. I thought it was pretty funny the changes we undergo in our children's eyes, so I made a little graphic to display the humor behind the evolution of a mom. Enjoy! So true! :) Love it. LOL -- my son is SO into the super-hero phase right now and has called me Super Mommy more than once! I love it - and totally agree! My son is going to be 4 in 2 weeks, and he's totally in the super hero phase!